January 7, 1988 Roy E (Spike) Hoyt (37) from the vessel Snug Seven was lost when a 32 foot inflatable kayak overturned in Anton Larson Bay. Kenneth D Dyer was able to swim to safety. January 12, 1988 The 32 foot Cape Karluk was lost while attempting to seek shelter in Russian Harbor near Geese Island Channel during a 40 to 60 mile per hour storm. Lost with the Cape Karluk were Eugene Neumoff (34), Merle P Ashouwak (24) and Jerry D Christiansen (30) all of Old Harbor. January 18, 1988 The 86 foot crab fishing vessel Wayward Wind sank nine miles south of Tugidak Island off the south end of Kodiak Island. Lost were owner and operator William “Red” Nietupski (45) of Port Williams, James C Baglien (47) of Kodiak, Dave Descloux (39) and Michael Descloux (46) of Kodiak. Debra Nielsen and Jay Rasmussen were rescued by a U S Coast Guard Helicopter after 9 hours in the water. January 26, 1988 Tyler Bricker was pulled overboard and lost from the crab fishing vessel Pacific Apollo. February 22, 1988 Joseph H Lang of Kodiak was crushed by crab pots and lost aboard the fishing vessel Icelander near St Paul Island. March 15, 1988 The 56 foot fishing vessel George W was lost outside of Uyak Bay with her crew of three; owner James Michael Miller (37), David Meersand (32) and Theodore O’Leary (27) all from Kodiak. April 7, 1988 The 52 foot trawler Emerald Sea was lost with 5 people aboard. The hull of the vessel was found washed up on the beach in Icy Bay April 10th. There were no survivors. Lost were skipper Greg VonSchweinit of Coos Bay OR, Mark VonSchweinit of Coos Bay OR, Danny Lamons of Puyallup WA, Eric Myrman of Ashland OR and Greg Lamons of Coos Bay OR. April 10, 1988 Two men were lost when an unnamed skiff capsized in Kachemak Bay near Homer. May 29, 1988 An unnamed skiff capsized in Chester Bay near Metlakatla and two of the three people on board were lost. May 30, 1988 Captain Rodney Main (44) of Tillamook, Oregon was lost when the 86 foot trawler Golden Venture rolled over and sank near Yunaska Island in the Aleutians. The vessel was making a turn with her nets down when the disaster occurred. Three of the four crewmembers abandoned ship to a life raft and were picked up by the fishing vessel Hazel Lorain. June 26, 1988 It was though that two men were lost from an unnamed dory that was found holed and overturned on the southwest shore of Noisy Island near Uganik on the west side of Kodiak Island. Further investigation revealed they had been murdered at their set net cabin by a third man who staged the dory accident. 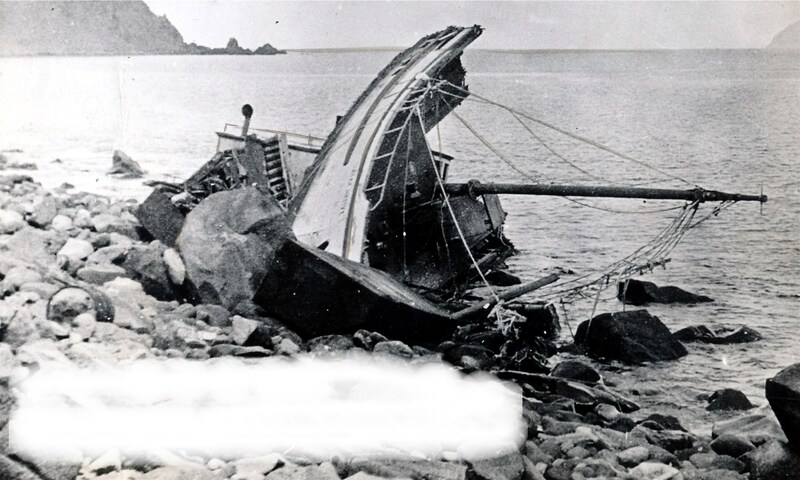 July 25, 1988 The 28 foot fishing vessel Mojo sank when her anchor line became tangled in Cameron Bay south of Sitka. Two crewmembers were rescued from the water by a U S Coast Guard Helicopter. Owner operator Jim Trow (62) was pulled from the water by the fishing vessel Sefora but did not survive. August 1, 1988 The 40 foot gillnet fishing vessel Yermon sank in Cook Inlet 12 miles west of Ninilchik with the loss of two crewmembers. All that was found were two hats floating in the water. September 11, 1988 The fishing vessel Freda capsized and sank at Dixon Entrance with the loss of one crewmember. September 13, 1988 Simon Tagarook Jr died of head injuries suffered when the unnamed aluminum Native whaling boat he was riding in collided with ice off of Kaktovik in the Beaufort Sea. September 27, 1988 Four men were thrown into the water in Kazakof Bay on Afognak Island when their unnamed 16 foot skiff overturned. Three made it to safety, but a fourth was lost. September 28, 1988 Only one of four fishermen survived when their unnamed skiff capsized in the heavy surf at the mouth of Deep Creek near Ninilchik. September 29, 1988 The fishing vessel Rosey Alice was consumed by fire in the Sitka Harbor and the lone person aboard was lost. October 3, 1988 The 42 foot longline vessel Sarah Maria grounded and was destroyed in Big Branch Bay on Baranof Island with a loss of 3 crewmembers. One crewmember survived and was picked up on Beavertail Island by a U S Coast Guard Helicopter. Lost were Robert Roy Tenney, Donald Paul Tenney and John Michael Glaab. November 2, 1988 An explosion and fire destroyed the Alaska Constructor killing 3 of 4 crewmembers. Lost were captain Stan Hanson (36) of Homer, engineer Bruce Babcock (34) of Anchor Point and Carl Anderson (58) fuel truck driver of Anchorage. First mate Stephen Hobbs survived by lowering himself by rope from the burning vessel and wading to shore. December 10, 1988 A severe storm sank the 115 foot stern trawler Arctic II 55 miles north of Unimak Pass. Two crewmembers were lost, including captain Stan Michna (33) and Gary Heeney (29). The other three crewmembers were rescued by the fishing vessel American Beauty. My husband David loved the sea. His passion gave us both the courage to pack up and move to Kodiak from Brooklyn. He loved the sea to death. How romantic a life, to live a dream. People sit and watch shows like the Deadliest Catch in awe. Well, I am in awe of the wives….sitting in the car waiting for the boat that never arrives. I am in awe of the wives that have to explain to their little children that daddy is not coming home ( and neither are the other guys on the boat who are our “Alaskan” family). I say….let’s say thanks to the hero’s that let their men live a dream and then turn the nightmare of tragedy into life. So sorry for the loss to you and your family. Seems like only yesterday that the George W tragedy was announced in Kodiak. They were known and loved by many. jim miller was an apprentice in the carpenters union in kodiak and we worked on several jobs together including helping his brother tom build a duplex just down the hill from kodiak high school.the george went down not long after we did. 1988 was a tough year. I am Jim Baglien’s sister, Vivian. I don’t think we ever get over the loss of a loved one.-Especially true of Jim Baglien. He loved Alaska from the moment we arrived in Ketchikan. Our Dad had taken a job at the new pulp mill there. My two brothers Jim & Ray loved the hunting & fishing along with our Dad, Mervin. Alaska took Ray at age 19 from a commercial logging accident out of Ketchikan. To lose a second son from a commercial fishing accident was extremely hard on our family. One never quite gets over it. I tear up every time I read about a new loss due fishing in Alaska. My heart goes out to all those who lost sons, daughters, Moms & Dads through Alaska ‘s harsh environment. However my Alaskan years are still remembered as some of the best- with wildlife to see, fantastic sunsets, engaging friends, wild weather, home town comradery, great fishing & hunting, gardens of bountiful veggies & flowers & long time friends no matter where you might be now. Wendy I often think of the summer I spent with David on the Chisana in 1986, his enthusiasm for the sea and love of life was infectious, I have some great photos from the boat and that memorable summer, can only imagine how awful that loss was for you and your 2 young children and the nightmare of the loss. I was stationed on Shemya Island in 1988 when crabbing vessel Ostey wrecked off the weastern shore. The crew had to be rescued from the grounded ship. It still lies there today as a rusting hulk. The 139 foot fishing vessel Opty, a former offshore supply vessel, was driven ashore by high winds and seas December 3, 1988 in Lost Harbor on the northwest side of Shemya. Thanks for the post Steve. I have not yet posted some of the losses from 1945 to 1990. There were many; too many. Thanks for all your effort here. The two men (brothers) lost June 26,1988, actually were murdered in their set net cabin by a crewman. He then staged the skiff to look like an accident. The bodies were found later that summer near the cabin. Thanks again Brent. I never made the association. I owned a charter boat back then and took the forensics scientist out to the cabin the do the analysis of the crime scene for the trial. So weird/random to be looking for information on The George W. ( Jim Miller was my Uncle) and randomly find information on this incident. I Set netted across the way at Broken Point in 1998/1999? and went over and visited the site a couple times. Scott, I started fishing Noisy Island in 97 and owned it up until 2008. We may have met at one of the Broken pt parties. Another strange thing is I fished in the winters since 1990 for Bill Polson and later bought one of his boats. He fished the George W and sold it to Jim. It’s possible. Actually I’m confusing 2 different years. I believe I visited the site in 97. Lacey Berns was there (that’s who my family went out there to see). then went set netting in 99? There was a summer solstice party but it was at a site farther inland. oh wow, I remember Bill Polson and his brother Louie. Childhood coming back to me. I ran and ended up owning that site from 96-2007. Lots of history out there. I was at another site in Uganik when they went missing. I set netted up at Ekuk on the Nushagak in Bristol Bay. Had some wonderful times. I lost a lot of friends in the ’80s, but the hardest loss was my step-dad, Jim Baglien, when the Wayward Wind went down. Hard to believe it’s been nearly 30 years. I remember his Dumbo sized ears and amazingly kind ways like I saw him yesterday. Jim, Johnny Smith and I picked a couple guys out of Chiniak Bay in the fall of ’79, six hours after their boat went down. We were coming back to town on the Ten Bears. Jim said those guys looked like buoys from a distance. But buoys don’t usually wave their arms so he turned to check it out. Their crab tank broke and the boat went down too quickly to send a mayday. Their survival suits were on the flying bridge and floated up. They suited up in the water and would have died if old eagle eye Baglien hadn’t been at the helm. He was so far sighted he could count the deer on both sides of Kupreanof Strait but couldn’t watch a movie at the Orpheum from the back seats. Those could be the best and the worst of times — sometimes both, separated by a few minutes. Thanks for researching and documenting those days. Sorry for your loss. The crew that you guys rescued October 6, 1979 came from the 48 foot vessel Harder. I have very little information about that loss. Thanks for sharing your story about Jim. The Wayward Wind loss hit many in Kodiak hard. The south end around Tugidak has claimed too many of Kodiak’s favorite sons. RIP Jim Baglien. jim was one of the good ones and his wife pam was the best. there were 12 kids orphaned that night we went down. i can’t believe it will be 28 years a week from today. What are the odds of me looking up my dad on the inter , finding this web page and seeing that my step brother Paul Delys wrote a comment about my dad Jim Baglien. I haven’t had anything this weird happen in a long time. I wish my dad never set foot on that boat , I’ve missed way to many moments in life that I never got to share with him:(. I miss you so much. Thanks Paul for remembering your step Dad & my amazing, kind, funny story telling artistic & very beloved brother. I don’t think one ever gets over such a loss. For my family it was doubly hard as another brother ,Ray just 18 months younger than Jim was lost to a logging accident out of Ketchikan in1961. My parents were devastated to loose yet another son to wilds of Alaska. We came to Alaska before it was a state in1953. Despite the double tragedy & loss, I’m sure my brothers enjoyed their Alaskan years. Yes, Stina they are greatly missed but rejoice in that your Dad, & Paul your amazing step Dad knew the dangers of working in the wild Alaskan elements, but enjoyed every minute, adventure, plus great stories that we all smiled, laughed, cried& remembered fondly one amazing man. James Carl Baglien. January 18 marks the end of his life,but it up to rest of us to remember with love he wS an amazing key part of our lives. Paul…. I teased Jim & called him “elephant ears” lol. They had also points… The Spock effect. Still one good looking guy. Dark curly hair, blue eyed & infectious grin, plus if you inherited the curl gene from our Grampa Jim Goddard- it was all or nothing. Jim& his four kids all were blessed with the” fuzz”& now generations of grandkids. Way to go Jim…. You will live on forever. in Northern CA. he moved to Crescent City with his mom, dad and kid brother. and kind young man. he came from a loving family, he was raised right, good people. He introduced me to his childhood friend Eric Hufford (who sadly passed in 1974). Anyways, I had heard Stan was fishing up in Alaska. You just don’t meet people like Stan Michna every day. God Bless to his family and friends. A good man surely missed by all that knew him. (Coop’s cousin). You know no matter how old the news is, its new when you hear it. sad…up in Humboldt and Del Norte counties…its either the ocean or the road/working mill, green chain…big rigs..lost alot of good friends to both. Rip Stan. Laurie, I was actually doing research on Eric Hufford, (a friend of my wife’s) when I came across this. Just curious how well did you know Eric, and how long did you know him? Did you also live in Orick? He actually died in October 1975 and I have visited his grave in Trinidad. I lived in Alaska from 1992 thru 2001, and then again for the summers of 2005 and 2006. I worked off boats occasionally, mostly in south east Alaska and Prince William Sound. Wanted to advise you that there is no Tillamook, Washington. Tillamook is in Oregon. It is incorrect in your May 30, 1988, accounting. Thanks Jo. I will edit it. If you ever run across a wreck you want more information about, I have very large files after 40 years of accumulating. I have digitized most of the information I researched before computers were invented. I have been researching shipwrecks since I was 14, and was looking up some fishing vessels tragedies mentioned on Deadliest Catch when I stumbled upon your page. Thank you for your excellent work!